A mysterious message appeared in my Facebook inbox the other day...a secret Bandcamp link to an unreleased four-song EP. I clicked through and got to hear the new 'Strange Party,' Radio(in)active EP a full week in advance of it's release on 7/20/2013. I have seen these guys perform, so I had an idea what to expect. 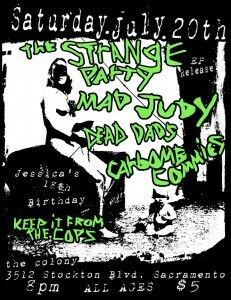 Anyone who read my column on the Sacramento horror-punk scene will remember the respect 'The Left Hand's' singer, Vic, holds for 'The Strange Party' and that both bands were to open for former 'Misfit' Michale Graves. That show was a huge success. The horror-punk genre is typically characterized by power vocals and a quick tempo married to simple, catchy melodic structures. The punk-edge of the guitar sharpened by the skilled mastery of a metal-head axe wielder. The Strange Party does not disappoint. Their talent and skill are presented here in some nice, clean recordings.